The Bubblehead Bride: H54F v. 8! 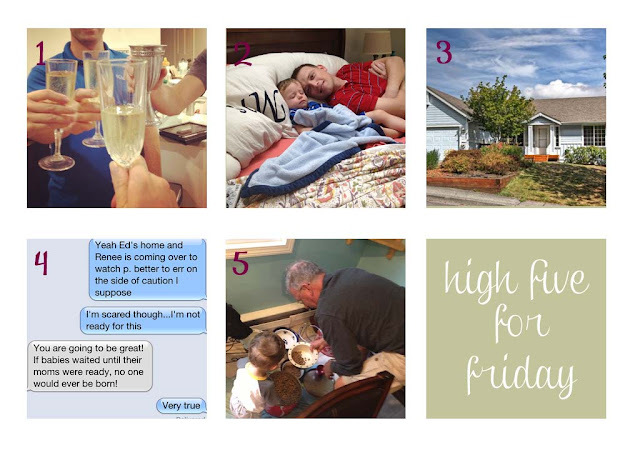 I am back for another fun link-up of High Five for Friday, after an unintentional hiatus! Unfortunately, not for the reason you might think. Still no babies. Things have been quite busy here, though, and I am back and ready to fill y'all in on what has been going on in our neck of the woods! 1.)) If you follow me on Instagram (@chelseymay72) you have seen this, but it remains a favorite and I swear I breathe a sigh of relief every time I see it. It does, however, require a little back story. In the summer of 2010 Ed decided that he wanted to buy a boat. He bought said boat and we had a fabulous summer playing on it. We made lots of great memories, we took the boat to Block Island, RI where he proposed, and many nights after work we would go out on the boat just to grill out for dinner and relax. The boat, however, was a MONEY PIT. It started having tons of trouble and I swear we might as well have been through money into the wind. Long story short, this past Friday WE GOT RID OF THE BOAT!!!! We have been trying to sell it with no luck and finally ended up donating it. Then we toasted good riddance to the Shelly Jake. Our friend Mike is also pictured here, as he is the one it took care of all of the issues while we were in Tennessee. It's true what they say -- the best days in a boat owners life are the day they get their boat and the day they get rid of it!! 2.)) I can't get over the sweetness of this picture. For the first time ever, Preston fell asleep completely on his own where he was laying. We were trying to pack some stuff for an evening away at some friends house and he was laying on the bed watching Mickey Mouse. Kid passed out! He slept like that for a good half hour. I can't believe how big he is getting! 3.)) We have a new house! This is, obviously, a crappy picture, but this is the only good one I have of the outside and it just doesnt fit. Regardless, we are in the midst of doing all the paperwork and, if all goes well, will close in the middle of October. Yay! 5.)) My parents have been in town this week to help with Preston and to get things ready for the girls arrival. My mom is going to be here indefinitely, while my dad will be traveling back and forth from our house and theirs. Along with my parents are their 2 dogs. Preston's favorite part of the day now is helping my dad feed the dogs. He is allowed to scoop the food into their dog bowls, and if that fails, he throws handfuls in there. Hope everyone is having a great day and a fun fall-esque weekend! Make sure you head over to Lauren Elizabeth to check our her H54F!